Okay, I'm about to get personal. It's time for new sheets. After a few years of use, my old conventional cotton sheets are wearing thin. So of course I'm going to seek out bedding made from sustainable fabrics, or at the very least, sheets that aren't full of chemicals or contributing to pollution. I thought this would be an easy quest. How hard is it to buy sheets? Surely there aren't that many choices to make when it comes to eco-friendly bedding. Wrong! First, one needs to consider the fabric. And it's not just a choice between organic cotton and bamboo (or peace silk if you're fancy). I've decided to look for 100% organic cotton, since there's still a lot of controversy surrounding the processing of bamboo into fabric (read about the pros and cons of bamboo here, here or here). 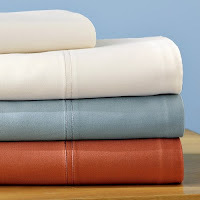 Next, just like traditional sheets, there are a variety of weaves to choose from -- percale, sateen, jersey, flannel, etc. I prefer the smoother feel of sateen over the crispness of percale or the t-shirt like feel of jersey. And then there's thread count. Most of the organic cotton sheets I found were around 230 to 250 thread count. The benefit of a lower thread count is durability, but if you like a softer sheet, generally you'd want a higher count -- 300 or above. There's also color. And how the fabric is dyed contributes to its eco-worthiness. Some organic cotton is color grown. Many organic cotton sheets are left natural or bleached white using low-impact bleaching. The rest of the reputable brands use low-impact or natural dyes. For me, not being able to see the product in person, the choice came down to price. I went with the West Elm sheets (color: fawn) for $69.99. Not bad for a set of organic cotton sheets.